In 1937 Duke Ellington's recipe for big band jazz was: "It don't mean a thing, if it ain't got that swing." Count Basie later added a caveat defining swing as something "you can really pat your foot by." Times sure have changed. 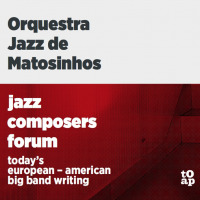 Portugal's Orquestra Jazz de Matosinhos commissioned pieces by eight modern composers of big band musicfour each from either side of the Atlanticfor their latest album and swing only rarely entered into the equation. Although something at least a little like it lurks in the best of these numbers. So what does form the basis of big band writing in the modern age? Not much help from Viriato Soromenho-Marques' sleeve notes, which say it provides "a glimpse of the promise of a time when we will free ourselves from the illusion of power and supremacy, and accept our radical finitude, our vulnerable incompleteness." Well, yeah... or did something get lost in translation? To accentuate the positive, the writing here perhaps signals a return to melody and coherence. Most notably so in "El Mauro" by French saxophonist Pierre Bertrand. There are echoes of Ellingtonmore specifically Juan Tizol's "Caravan"in this really quite catchy number, which features fine solos by André Fernandes on guitar and José Pedro Coelho on saxophone. The slow building, lilting "Tiempo & Lugar" by the Argentinian Guillermo Klein, who trained at Berklee, also has a lot going for it, including a nicely constructed flugelhorn solo by Susana Santos Silva, one of two woman members of the orquestra. German pianist Florian Ross contributes another of the better constructed, less episodic pieces, "Tremor," which sounds remarkably like "Old Devil Moon" on occasion. Here the flugelhorn solo is handled by Javier Pereiro. American Ohad Talmor's "Étude No.2" is a trifle academic but interesting here and there; so too "All In (For Laurie Frink)" by Canadian Darcy James Argue. "OJM" by Steven Bernstein, from the US, and the closer, Belgian Frank Vaganée's "Reclusion" could both have benefitted from judicious editing. You'd be hard put to pat your foot to (or by) this selection of what the sleeve bills as "today's European-American big band writing," but it definitely does have its moments. Track Listing: Étude No2; El Mauro; All In (For Laurie Frink); OJM; Tiempo & Lugar; Tremor; Another Escapade; Reclusion. Personnel: Personnel: Josée Luis Rego, Joao Pedro Brandao, Mario Santos, José Pedro Coelho, Rui Teixeira: woodwinds; Gileno Santana, Javier Pereiro, Rogério Ribeiro, Susana Santos Silva, Ricardo Formosa: trumpets and flugelhorns; Daniel Dias, Alvaro Pinto, Andreia Santos, Concalo Dias: trombones; André Fernandes: guitar; Carlos Azevedo, Pedro Guedes: keyboards; Damian Cabaud: bass; Geoclandio Monteiro: percussion; Marcos Cavaleiro: drums.